Product prices and availability are accurate as of 2019-04-17 03:10:29 EDT and are subject to change. Any price and availability information displayed on http://www.amazon.com/ at the time of purchase will apply to the purchase of this product. "Cute Donuts!" "The donuts turned out great. They were so yummy and popped right out" "Perfect little donuts" "This pan works great and the donuts popped out easily!" 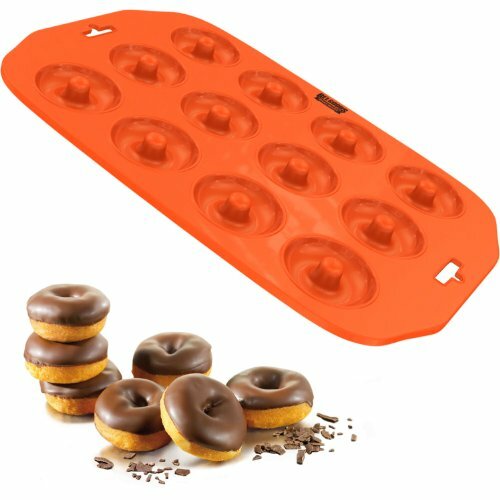 How a silicone mini donut pan helps you bake the best mini donuts! Don't you just hate it when your mini donuts stick to their liners after all the hard work you put into preparing and baking them? Not to mention the nightmare cleaning your mini donut pan! 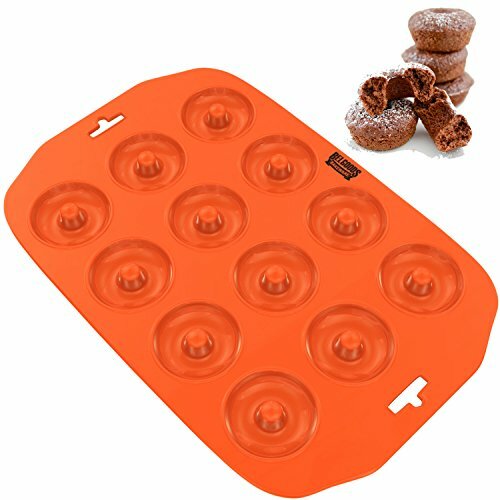 Use our non-stick, unbreakable, easy to clean 12 cup mini donut pan and start baking like a professional! - The donuts don't stick to the pan and pop right out while retaining their beautiful shape. - The nonstick qualities of silicone will make cleanup a breeze. 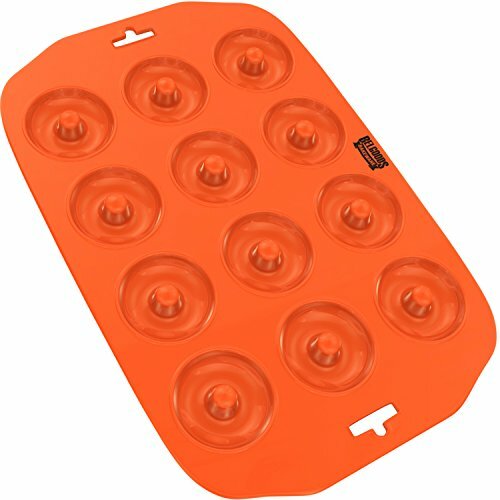 - Forget about damaging iron cast pans while using them, silicone pans are flexible and unbreakable. - Silicone pans are very convenient to store and won't dent. Bake perfect mini donuts every single time! "Excellent performance - non stick, easy clean up & consistent even baking" "Five Stars" "No more digging out donuts to make a crumbly mess!" "Great product and customer service" "Tasty Bite-size Donuts in a Snap" ORDER TODAY. Limited Stock. BAKE LIKE A PROFESSIONAL - Heat-resistant up to 445°F; Holds 2 tablespoons or 1/8 of a cup; Measures 11.4 x 7.9 x 1 inches; Donut diameter is 1.77 inches; Usable in any oven, microwave oven, dishwasher or freezer. 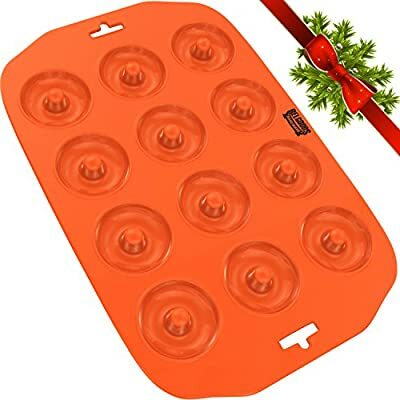 NONSTICK SILICONE - The mini donuts won't stick to the pan and will pop right out while retaining their beautiful shape; Naturally nonstick silicone; No chemical coating containing PFOA like most metal bakeware. 100% PURE FOOD GRADE SILICONE - FDA & LFGB Certified; 100% BPA-free; No plastic fillers like cheaper brands often use fillers can compromise the quality and durability of silicone; Pure silicone will retain its color (See image gallery). 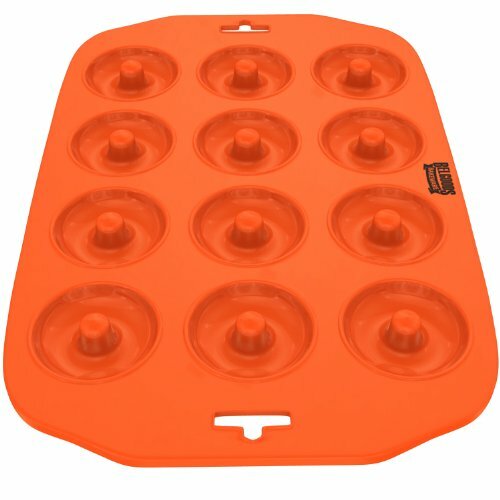 VERY EASY TO CLEAN - Silicone bakeware is much easier to clean than traditional metal or aluminum bakeware. The nonstick qualities of silicone will make cleanup a breeze, no more scrubbing for hours. ### SPECIAL HOLIDAY PRICE - Take Advantage While It Lasts! ### BUY IN CONFIDENCE - You're fully covered by our 30 DAY MONEY BACK GUARANTEE and you will also receive our FREE baking tips and recipes EBOOK!